Definitly Red is on the injury sidelines after being brought down in the Gold Cup. BRIAN ELLISON says stable star Definitly Red faces a race against time to be fit to chase Grade One honours at Aintree’s prestigious Grand National meeting next month. The 10-year-old has required five stitches to a knee injury sustained when Danny Cook’s mount, owned by Phil and Julie Martin, was brought down by the stricken Invitation Only in the Cheltenham Gold Cup. Phil Kierby (left) and winning connections after Top Ville Ben, a Grand National contender of the future, won at Wetherby. While the Malton trainer has always maintained that the Betway Bowl – Aintree’s Gold Cup – is tailor-made for Definitly Red he is simply relieved that the injuries were not as serious as those sustained by Invitation Only, who had to be euthanised. 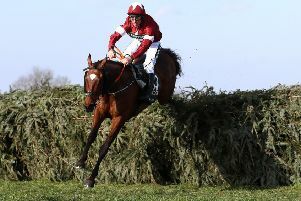 The misfortune at the 10th fence continued Definitly Red’s bad luck in big races – he had to be pulled up in the 2017 National after Cook’s saddle slipped following a melee at Becher’s Brook. 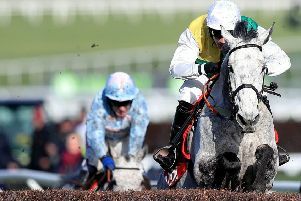 Ellison admits to feeling sickened when the screens went up at the 10th fence in the Gold Cup – he did not know which horse was badly injured – and he has passed on his good wishes to Invitation Only’s trainer Willie Mullins whose Al Boum Photo went on to win the blue ruband race under an inspired Paul Townend. But he is already turning his thoughts to next season – and is not ruling out a third tilt at the Gold Cup. Sixth last year, Definitly Red, who won Wetherby’s Charlie Hall Chase and Aintree’s Many Clouds Chase this season, was travelling well when coming to grief. Though a second tilt at the National was likely to be the horse’s number one objective for 2020, Ellison says he will talk to the owners once the horse has recovered from his current setback. Meanwhile, next year’s National could be the target for Phil Kirby’s Top Ville Ben after his novice steeplechaser returned to winning ways at Wetherby yesterday. A wide-margin winner at Hexham and then Wetherby on his first two starts over larger obstacles, the seven-year-old fell at the sixth fence in last Wednesday’s RSA Chase at the Cheltenham Festival. However, Top Ville Ben, ridden with confidence by Sean Quinlan, who is enjoying a career-best season, reaffirmed Kirby’s faith – and fitness – with this eyecatching win. With Louis Vac Pouch and Noruki coming down two out it was left to Sam’s Gunner to chase the winner home – some 37 lengths adrift – and confirm Kirby’s status as Wetherby’s leading trainer for 2018-19. “That was really good, and we’re back on track again,” said Catterick-based Kirby. “He jumped brilliant – he was just too brave at Cheltenham, unfortunately. He’s very talented. I thought he had a real each-way chance at Cheltenham. He was good today and will go for the three-mile novice chase at Aintree. Kirby also gave Blaklion a gallop after racing as his recent acquistion steps up preparations for next month’s National. Bought for £300,000 by owner Darren Yates specifically to run at Aintree next month, Blaklion has been allotted a weight of 10st 12lb for the £1m race and is guaranteed a run in the world famous race. Kirby, who has enjoyed the best season of his fledgling career to date, felt a change of scenery would do the 10-year-old good with the clock ticking down towards his date with destiny – and he completed two circuits of the course.